Everyone knows there is a stock market and cannot help but hear daily updates—whether they understand it or not. Here are some basic principles and terminology that can help clients better understand the stock market and their investment decisions. Everyone knows there is a stock market and cannot help but hear daily updates—whether they understand it or not. Here are some basic principles and terminology that can help clients better understand the stock market. Part I of this article discusses terms that small and large business owners have heard and shares my views on how these can best be explained to them. Earnings per share (EPS)—This is the amount of the company’s net income divided by the number of average shares outstanding during the year. Price earnings ratio (P/E)—This is the price of one share divided by the EPS. Often stock valuations are referred to as cheap or high and this is based on whether there is a low or high P/E relative to other companies in their industry sector and the market as a whole. Annual dividend—This is the dollar amount that the company pays to its shareholders in a year. They are paid quarterly unless specifically stated. Dividends are usually paid out of the company’s profits. Dividends are expressed as a per share amount. In most cases, this is the only return an investor receives from the company they invest. Profits come from other investors when they sell their shares. If the stock is sold at a loss, there will be a negative return if the loss exceeds the dividends paid. Yield—This is the annual dividend per share divided by the market price per share. This is expressed as a percentage. It is an annual yield and is based upon the price paid. If the stock is already owned, the yield is then based on the current market price. Dividend payout percent—This is the percentage of EPS paid as dividends. A low percentage indicates the ability to either increase dividends or use the retained profits to reinvest in the company or even to buy back shares. A high percentage indicates the opposite. Market capitalization (Mkt cap)—This is the total value of the company as measured by the market value of its outstanding shares. This is calculated by multiplying the price per share by the number of the outstanding shares. Stock buy backs—This is when a company announces and then executes a stock buyback strategy. The company will use part of its retained earnings to buy shares in the market. Occasionally, they will use borrowed funds when they feel the return on the loan will be greater than the interest paid. This has the effect of reducing the outstanding shares and increases the EPS and P/E ratios making the stock price seem more of a “bargain.” This affects the company since there is less cash or more debt and interest expense. This illustration assumes no change in the profits. Forward P/E—The current P/E is usually a trailing number. This means the previous 12 months earnings per share are divided by the current price per share. That is what is shown above. The forward P/E is the expected earnings for the next 12 months divided by the current price per share. Comparisons of P/E—Every company with a profit has a P/E. How they relate to the market as a whole and their sector provides a context of how that company stands with the rest of the market and their peers. By way of comparisons to the market, the major indexes you can check the P/Es for are: the Dow Jones Industrial Average (for large cap blue chips), S&P 500 Index (for the 500 largest companies), NASDAQ 100 (for the largest companies traded in the NASDAQ), and Russell 2000 (for the small caps). Further, the S&P 500 has sector indexes that can also be used as benchmarks. It is suggested comparing these on a regular basis or at least monthly. Sales per share—This is the total sales of the company divided by the number of outstanding shares. These are used as a guide and as a comparison tool. Buying stock on margin or purchasing shares with borrowed money greatly magnifies the risk of stock ownership. Margin buying uses leverage to accelerate gains, but also losses. If a stock bought on margin starts to drop, the broker may call in the loan and force a sale. Interest charged on any loans reduce the potential for profits. Socially conscious investing—Denying capital to a business a client disapproves of is a perfectly reasonable political act. But it does not make a whole lot of sense when it comes to investing. Refusing to buy shares in companies you dislike (say, tobacco makers or companies with a poor record of promoting diversity or that do things that harm the environment) does not deny them anything—when you buy a stock, the money goes to the previous shareholder, not the company. Socially conscious investing can work to effect change when there is a coordinated effort with widespread support. For the most part, though, you would be better off investing to maximize your return and then giving some of your profits to charity. Technical analysis—Technical investors believe that patterns in stock charts predict the future. Technical analysis may not be a foolproof method, but, if properly used, can provide helpful insights. Rising trading volume for a stock, for example, is generally a positive sign. And strong volume on up-days is a positive sign for the overall market. Another useful indicator is market breadth—when more stocks are rising than falling, it is usually bullish. It is also good if different stock indexes move up together. But if major indexes head in different directions, that divergence may be a signal that a bull market is running out of steam. By the way, a market is bullish when it is rising or expected to go up and bearish when it is falling or expected to go down. Company valuation—When referring to a stock’s “valuation” the P/E is used as the reference guide. A low P/E represents a better valuation than a higher one. A stock is said to have a high valuation when its P/E is relatively high. An eight P/E is a low valuation; a 22 P/E is a high valuation. However, if most stocks in a sector have an 11 P/E then one with a 16 P/E is referred to as having a high valuation. If a sector has a 12 P/E and the market has a 17 P/E then that sector is referred to as being cheap. P/E ratios change as the price of the stocks increase or decrease; and as earnings per share change. An example is a stock with a 25 P/E, e.g., a stock with a price of $75 and an EPS of three dollars. The company is a growing company and its EPS increases to five dollars, but the market now thinks that growth reached its potential and a 14 P/E is now appropriate for that company, so the new price per share would become $70. Here, the earnings grew 67% (an extremely high amount) but the price per share declined. There is a strong relationship between earnings, what the stock is selling for, and the expectations or valuation placed by the market. In many cases, expectations of future growth drive the valuations. When those expectations decline, so will the P/E. A company with declining earnings will typically sell at a low P/E waiting for the value to reflect future leveled off decreased profits. Contrarily, a company with expected future increasing profits will sell at a high P/E waiting for the value to reflect future increased profits; or for the earnings to catch up with the price. When these stocks are bought, the investor gives up some stock price growth and future value by buying those stocks now. Note that there are many factors determining the price of stocks and these are a small part of it. The growth in prices of tech stocks in the late 1990s were based in part on unrealistic or in some cases, no P/E ratios. At some point reality set in and the prices plummeted. Remember that the price of a stock is the present value of the expected future returns from that stock. A company with a high P/E needs many years of high earnings growth to balance an eventual declining P/E once “unlimited” expectations develop a “limit” of growth. Also, a high P/E represents optimism in the growth of the company and its earnings. A low P/E represents pessimism (or a leveled off stable mature company). P/Es are also determined for the indexes. However, a couple of major components could have very high or low P/Es that could skew the index. To better determine the P/E for that index and the prospects for change, you would need to look at the individual components. For the Dow Jones Industrial Average you would need to look at all 30 stocks or minimally the top 10 or 15 valued components. For the S&P 500 you might need to look at the top 30 or 40 stocks to get a feel for that index’s P/E prospects. Also, the changes in those indexes might drive the market trend, so understanding the major components and how they affect the index and/or market might give you a strategic advantage. Value attributed to dividends—If there no longer was a reasonable expectation that stock prices will increase beyond minimal amounts, then the primary reason someone would want to own stocks would be for its dividend. And then the value of the stock would, or should, only be represented and realized by the dividend and what that desired yield should be. Inherent in acquiring stocks is some recognition that there is an appreciation factor and this should reflect a dividend yield that would be lower than a comparable (if something like that actually existed) fixed income investment. There is also a risk factor that the stock could decline and result in a loss in the stock price. It is also important to look at the company invested in that is not paying a good or reasonable dividend and determine the value that needs to be placed on their future growth and their utilization of the earnings they are retaining by not paying dividends along with the likelihood of dividend payments or increases. When a stock is primarily acquired for the dividend, then it must be compared to fixed income yields and the stock’s price would behave based on the expected yields irrespective of expectations about increases or decreases in its market value. Expectations affecting value—Many things besides individual investors’ expectations affect stock values. 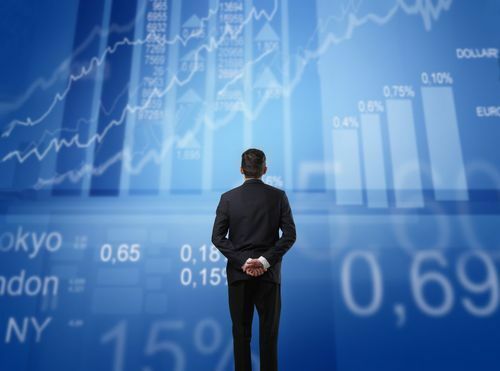 The interplay with global economies, other markets such as bonds, commodities and foreign currencies or mutual fund redemptions, and derivative trading also can greatly affect the stock market values. Irrespective of any “scientific” analysis of the stock market, stocks have shown a remarkable ability to rebound. Just look at the aftermath of Black Monday in October, 1986, the bursting of the tech bubble in 2000, and the recession of 2008/2009. All the losses in the major indexes which represented diversified portfolios were made up at some point while dividends continued to be paid and increase in a steady manner. This indicates that the long-term stock market trend is up, just that it is not a steady growth, and it does have bumps in the graph line, and the bumps could happen just before someone might want to get out. That is why we suggest that stocks should be considered only for long-term investors. Conclusion—This article covers many of the basics of stock market investing. There is much more, but this should help clients get started in considering stocks. Investing in and understanding the stock market is involved, confusing, and has many facets. To help clients decide, the client’s financial advisor needs to patiently explain how the market works, guide the client to seek out other resources, to offer their opinion on whether they think the U.S. or Global economy will be stronger in seven to ten years, and whether they think that strength will be reflected in the values of the stocks of the major publicly traded corporations. If they think so, they should be advised to consider investing in common stocks. Otherwise, they should stay in fixed income. Mr. Mendlowitz can be reached at (732) 964-9329 or by e-mail to emendlowitz@withum.com.